A therapy dog named Tucker visited with cardiac ICU patient Jim Cawley, of Seabrook, NH at MGH in Boston. Comforting patients like James Cawley. Cawley was in his third week in the Massachusetts General Hospital cardiac intensive care unit. The 10-year-old Lab had passed a rigorous exam, joining an elite group of dogs (no cats here), allowing him access to one of the hospital’s most restricted floors. Tucker’s owner, volunteer Bobbi Evans, lifted his front paws onto Cawley’s white blanket, and the retired police officer reached out as far as all the tubes would allow to stroke Tucker’s pale yellow fur. “What’s happening buddy?’’ he said softly. Tucker’s tail wagged furiously, and Cawley’s eyes welled up. Therapy pets have been used in medicine for years to calm and distract anxious and uncomfortable patients. But canines in the ICU? Mass. General is one of a few hospitals that have allowed them into the units where the sickest patients stay. When critical-care staff have pushed for pet therapy programs at many hospitals, they have met resistance from infection-control colleagues worried about the spread of disease. But last month, doctors from the influential Johns Hopkins Hospital in Baltimore wrote an editorial saying they have found that therapy dogs humanize and soften the fraught ICU experience. Many patients experience tremendous suffering, loneliness, and stress in the ICU, where they are often bedridden, hooked up to monitors, and powerfully sedated for long stretches. There is a movement in medicine to give fewer drugs to ICU patients, but that also means they are more aware, so it becomes even more important to create an engaging environment. Johns Hopkins doctors wrote in the journal Critical Care that their experience bringing a Westie named Pippi and a golden retriever called Winnie to visit about 10 patients in the medical ICU over the past year was a success. The dogs motivated patients to stand up and bend over — necessary tasks in rehabilitation — and generally lifted their moods. The hospital worked closely with infection-control staff to minimize risk, and there have been no issues. Tucker had a busy day at Mass. General, played with Jillian Brunet of Danvers, who was visiting a patient. 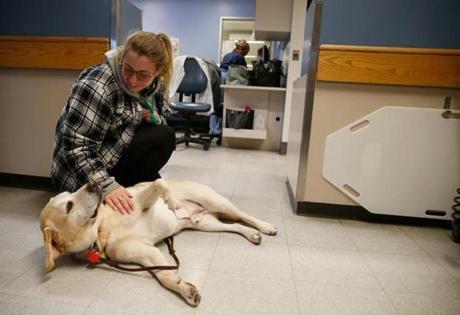 Beth Israel Deaconess Medical Center brings dogs into the ICU lounge for staff, as do other hospitals. 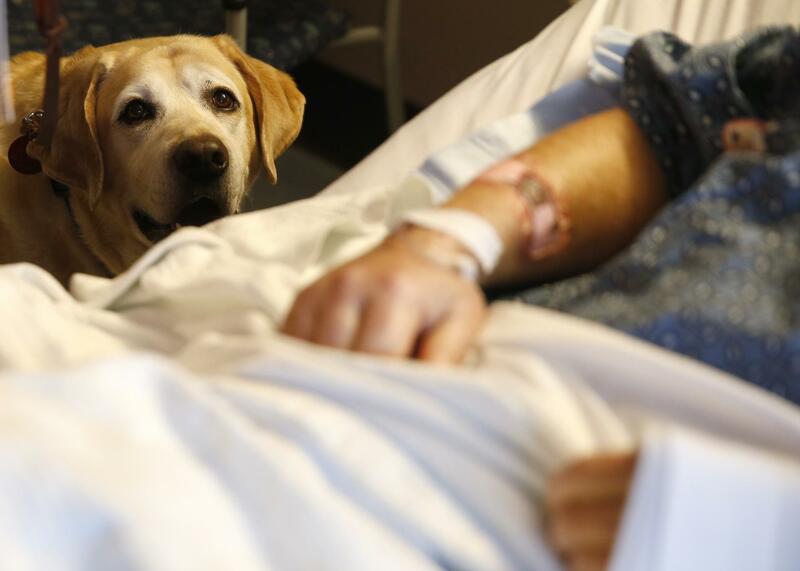 But while most institutions are hesitant to bring therapy pets to visit ICU patients on a regular basis, Mass. General has been at the forefront of the idea. Tucker and his canine colleagues have been going into patient units at the hospital, including the cardiac intensive care unit, for more than a decade. The pediatric cancer outpatient clinic was added last month, bringing the total to 19 units. But infectious-disease concerns have stopped the program from expanding into other types of ICUs, where patients are more likely to have infections — or to be vulnerable to them. The worry is that animals can spread disease or bacteria. Therapy dogs at Mass. General must be bathed the day before their visit, immunizations must be up to date, and owners must wash their hands after leaving a patient’s room. The dogs are also a limited resource — Mass. General has about 10 in its program. When Evans and Tucker arrived at Mass. General from Duxbury last week, the owner was handed a list of her dog’s assignments. Nurses approach patients who they think would benefit from pet therapy and who are alert, relatively stable, and not on special infection precautions. Many patients in the cardiac intensive care unit are conscious and have been cooped up for weeks. They are waiting for a heart transplant or, like Cawley, waiting until they are well enough for doctors to implant a mechanical heart pump. Cawley, 60, had been walking around the unit the previous day, but a minor setback sent him back to bed that day. Tucker took a carrot from James Cawley. His nurse lowered his bed rail. At 77 pounds, Tucker was deemed too big to get onto the bed, as some smaller therapy dogs do, but staff got him as close as they could to Cawley. Evans, Tucker’s owner, asked him about his work as Cawley patted the dog’s head. Cawley softly told her that he once trained German shepherds to sniff out bombs for the Air Force. Evans pulled a small carrot from her pocket and gave it to Cawley to feed to the dog. The Pets and People Foundation in Acton certifies all Mass. General therapy dogs. Dogs must be calm and follow commands, and staff put those qualities to a serious test during the half-hour screening. Dogs are expected to maintain composure in a hallway crowded with a person in a wheelchair and another using a walker, as a third person bangs together metal pans. And the canines must resist a hot dog left on the floor and a sandwich held out by a tester. Now that’s self-control. “People think you just need to have a lovable dog, and that is all there is to it,’’ said Candy Mandel, president of Pets and People. The group also certifies therapy cats, though there are none on Mass. General’s roster. 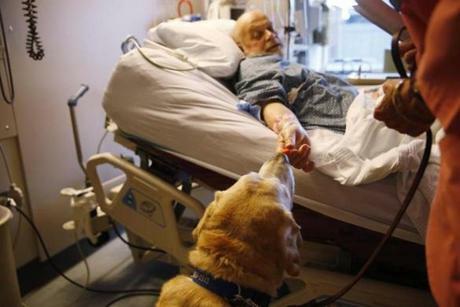 While research shows that pets have a positive impact on nursing home residents and hospital patients generally, there are few studies based in the ICU. But those that have been done have found that Cawley’s reaction is common. After visits with therapy dogs, patients report less anxiety, pain, and fatigue. “They are usually so much cheerier,’’ said Susan Gordon, one of Cawley’s nurses. Some research, including at Mass. General, has found that patients’ pulse, blood pressure, and respiratory rates drop. But the results have been mixed, and it’s unclear how long any positive effects last. Amanda Coakley, a nurse who heads Mass. General’s pet therapy program, is developing a research protocol to better measure the impact on patients. The ICU is a good place to do that, since patients are already connected to monitors. As for Tucker, Evans said, the lab has seemed lonely because the family’s other retriever recently died. But when she pulls out his blue Mass. General vest and identification tag at home, he perks up.